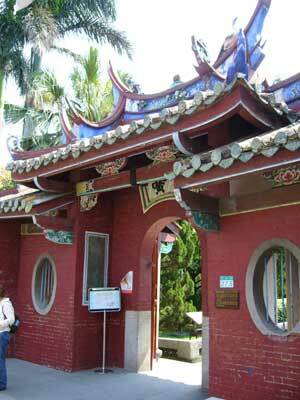 The Hong Gate and Pan Gong are at the main entrance of the temple, on the right and left respectively. In some Confucius temples, these are made into an honorific arch or in the form of a tower above and a gate below. The Hong Gate (west gate) and Pan Gong (east gate) are both gate towers of the double eaves type, with a "swallow-tail" ridge and a middle that opens up as an arch with circular windows on the either side. From Da Long Street you can see its beautiful exterior appearance.